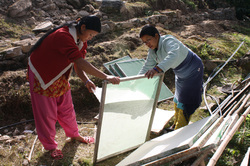 Project Sikkim, a volunteer-initiated programme to Sikkim, India, was set-up by a group of individuals who have a strong passion for serving disfranchised communities. In collaboration with the Sikkim Development Foundation (SF), Datacraft Asia(presently known as Dimension Data Asia Pacific) and Telok Blangah CC's Youth Club (YEC), we aim to touch the lives of the Sikkimese community in the Borong- Polok village through knowledge-sharing via various means of Education. The Project, culminating in a visit to the village in December 2010 and December 2011, was fully sponsored by Datacraft Asia(presently known as Dimension Data Asia Pacific) and involved the collaborative effort of a team of volunteers who exercised ownership over the planning and execution of the initiative. Vidyalay, the hindi word which means Education, is formed with the combination of two words: Vidya which means knowledge, and Lay which means to earn/pursue. So with Vidyalay directly translated, it means to pursue knowledge. or simply, Education. Team Vidyalay comprises of a good mix of 18 volunteers from all walks of lives, including students from Singapore Management University (SMU) & LASALLE College of the Arts. Each armed with a particular skill-set unique to the individual, and coming from a diverse educational & cultural background; every volunteer was carefully handpicked from the wide array of applicants. 2) Education in basic computer skills. The underlying intent of the entire project lies in the dedication to facilitate the sustainable development of the village through yearly injections of educational support. This would allow the children & teenagers to gain the perspicacity in propelling in their scholarly achievements, as well as the villagers to acquire the technical know-how and knowledge to improve their product development & manufacturing processes in making their hand-made paper products globally available and competitive. The over-arching aim for this annual project is to allow for the gradual achievement of sustainability for the village of Borong-Polok, both through the honing of young talents who would contribute back in the near future, as well as the expansion of global sales and job opportunities of the PMU, in the name of education.